Mr. Siegfried Herzog addressing FNF alumni. The Head of the Asia Desk of the Friedrich Naumann Foundation (FNF) Siegfried Herzog visited Manila from June 20 to 23, 2005 for talks with the Foundation’s partners and political friends in the Philippines. Among the highlights of the three day visit were meetings with Senators Rodolfo Biazon and Francis Pangilinan, both members of the Liberal Party (LP). Mr. Herzog also met with LP Director General Mrs. Chit Asis, the leadership of the Kabataang Liberal Ng Pilipinas (KALIPI) and the board of directors of the National Institute for Policy Studies (NIPS), the liberal Foundation’s main partner in the country. Manila being the center of important regional partners Mr. Herzog held informative talks with members of the Regional Working Group for an ASEAN Human Rights Mechanism, the Council of Asian Liberals and Democrats (CALD) and the Young Liberals and Democrats of Asia (YLDA). 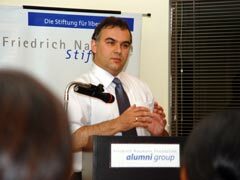 On June 22, 2005 the Foundation’s senior official attended a forum of the FNF Alumni Group where he delivered a speech on “Globalization, Europe and Liberal Politics in Germany.” The text of that presentation may be viewed at our liberal library. “This is my first visit to the Philippines in my official capacity,” said Mr. Herzog, who is married to a Filipina and has been to this country on several private trips before. “I am impressed by the dynamism of Philippine liberalism and also the close partnership of the liberal forces with the Foundation,” he concluded.